Had a massage recently at the Happy Head? Get $7 off your next massage within 7 days! Here’s a little secret that most business don’t want you to ever find out! They want you to keep coming back and buying more of their stuff! If they wan’t you to come back, why the heck do they make it so difficult? I’ve recently been to a few businesses that once they had my money, they dropped me like a bad habit. There was no follow up deal. There wasn’t even a thank you for your business. I think that’s sad. Thanks to our wonderful Happy Head customers, the Happy Head has gotten to a point where we can eliminate spending advertising dollars on acquiring new customers, and instead focus our time, energy, and resources on giving you, our existing customers the best deals possible. That’s why we now offer our existing customers the new 7 For 7 Deal. It’s no secret…we want you to come back and keep coming back. Come back for another massage within 7 days of your last massage and get $7 off your next full body massage purchase. 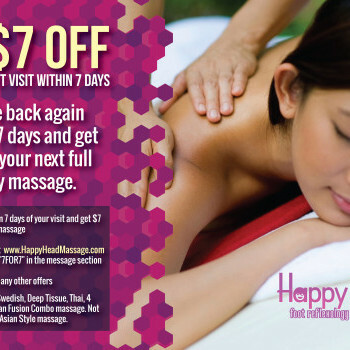 Just book online at www.HappyHeadMassage.com and use code “7FOR7” in the message section. It’s not valid with any other offers and it’s only valid within 7 days of your last massage at Happy Head. It’s that simple. This massage is valid towards the one hour or more Swedish, Deep Tissue, Thai COmbo, Asian Fusion, or 4 Hand Massage. Not valid towards Asian Style massage.